The following obituary appeared in the Independent Newspaper on 14 November 2000 and was written by Emmanuel Cooper. It is reproduced with the kind permission of Independent Newspapers plc. 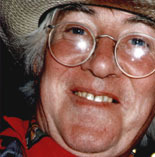 Mike Hughes Classicist, musician, linguist, educationist and arts administrator, Mike Hughes was a creative all-rounder in the arts, both responding to and helping shape our understanding of ancient and modern history, and contemporary visual culture. Born in Liverpool to an Irish family - his father was a docker, Hughes visited Ireland regularly, becoming fascinated by its culture and history. He was the first in his family to attend university and arrived at Liverpool University to further his Irish studies by choosing to read Gaelic. To his disappointment, he discovered that he was the only student and the course was cancelled, though he did go on to become proficient in the language. Forced to choose other subjects, he opted for Latin and Ancient History, concerns he continued to follow throughout his life. 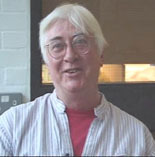 Following a period teaching Latin to the boys at Scarborough College, he was appointed research officer at St Matthias College of Education in Bristol in 1973, to work on the Bristol Cambridge Classics Project. Radical and enlightened, the scheme had the aim of relating Latin to modern life and breaking down the elitism usually associated with the subject. Returning to original texts such as the inscriptions on tombstones, Hughes made new translations in popular English that brought them vividly into the modern world. Aimed at children in comprehensive rather than public or grammar school, the books and study packs succeeded in catching the imagination of often reluctant pupils. Topics examined included various aspects of ancient life, whether the preparation of cloth through spinning and weaving, which involved practical work in the classroom as well as translation, to the thrills and spills of the mythology of ancient Rome. This material continues in use today. Three years of unemployment followed. With his wife, Catherine, and a young family to support, Hughes was ingenious and inventive in eking out a living. To practise his musical skills he became a busker, playing ancient music on his violin in the subways of Bristol. He set up a highly successful music group, 'The Court Pied Poudre', that specialised in Baroque and medieval music. Thirdly, and closest to his heart as a committed family man, he formed a Family Circus, which successfully performed at such functions as children's parties, fairs and old people's homes. An invitation to do some teaching at what was then Bristol Polytechnic, (now the University of the West of England), took him to the graphics department. Here he became involved with the ceramics course, fascinated by its intrinsic creative nature and the relationship of ceramic objects to material and social culture. Recalling his study of objects carried out as part of his study of Latin cultures, he recognised an affinity in the way they were part of society and sought to explore the similarities. Although the Bristol BA course, Iike others around the country, was mainly practical, Hughes, a non-maker, had little trouble in responding to and stimulating the students. He was so adept at coming to grips with the subject that he was appointed head of department - one of the first major ceramics courses in the country to appoint an academic rather than a potter. One of his innovative schemes was to set up a relationship between the college and the ceramics department of the Victoria and Albert Museum whereby students went to look at and handle pieces in the collection. This often involved opening cabinets that had been closed for decades. From these sessions students produced work in response to the pieces they saw, a further way of making the past relevant to the present. Aware of the plethora of books on various aspects of ancient history, Hughes saw a huge gap in the literature around the social, economic and creative lives of studio potters, but knew from talking to them that a wealth of material existed that had not been recorded in any way. With the support of the potter Walter Keeler, Hughes set up the ambitiously named National Electronic and Video Archive of the Crafts (NEVAC), and following a successful application to the Crafts Council for a grant, got the project moving by interviewing and recording potters. The more he investigated, the more fascinated he became, enthralled by the combination of social and cultural history, slowly building up a wide knowledge of both the individual and collective background to 20th-century studio pottery. Sometimes he talked to potters for days before sitting them in front of a tape recorder - or more recently a video camera - while he or someone else elicited their history in many hours of conversation. As the project became more ambitious links were made with other educational institutions in an attempt to make the archive generally available. 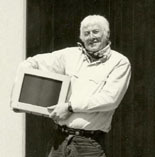 Fuurther to facilitate this Hughes was instrumental in establishing an MA course at the West of England University, which combined practical work with the use and understanding of archival recording. Such illustrious potters as David Leach, Marianne de Trey and Mary Wandrausch have provided invaluable material about themselves and their work. More recently Hughes, with the potter Roger Michell, was involved in a comrnunial project at Bristol Royal Hospital for Children decorating a hydro-therapy pool. As part of the collaborative scheme, Hughes wrote stories and poems about Bristol and these were illustrated by Michell. The tiles for the walls were made by Hughes's daughter Hawksmoor, (named after his favourite architect), who has recently graduated from CamberwelI School of Art. Intrigued by the enormous practical problems of making 3,500 tiles, Hughes avidly discussed technical problems and glaze possibilities. The pool is due to open next March. When diagnosed with cancer, Hughes remained as committed as ever. When he was too weak to go out visiting, Latin-speaking friends were gently urged to read Virgil to him. Shortly before he died, surrounded by his family, a priest was found able to say mass in Latin, a fitting end to a remarkably full and creative life. 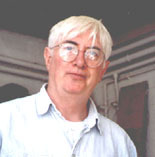 Michael John Hughes, educationist: born Liverpool 6 May 1942: married 1971 Catherine Hoare (one son, three daughters); died 31 October 2000.